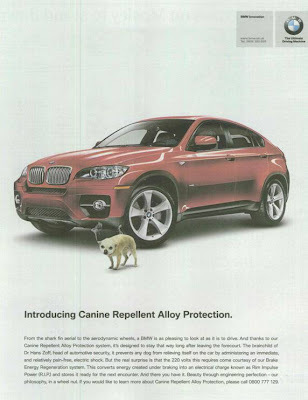 BMW have a long history of running April Fools Day campaigns and April Fools Day 2008 sees them advertise the 'Canine Repellent Alloy Protection' system in UK newspapers. NEW - 2017 BMW April Fools: the BMW dDrive dog basket! “From the shark fin aerial to the aerodynamic wheels, a BMW is as pleasing to look at as it is to drive. And thanks to our Canine Repellent Alloy Protection system, it’s designed to stay that way long after leaving the forecourt. The brainchild of Dr Hans Zoff, head of automotive security, it prevents any dog from relieving itself on the car by administering an immediate, and relatively pain-free, electric shock. 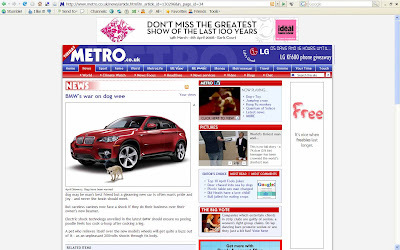 Sure this will get lots of comment and debate today - more good April Fools work to carry on BMW's tradition! I love the acronym used!! x6 is phenomenal car, they dont have any problems mechnically so far.